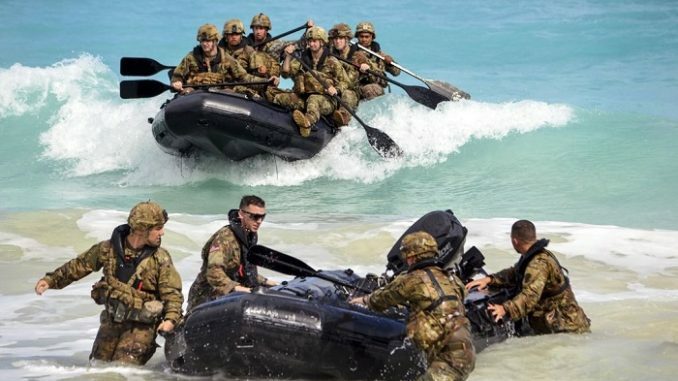 Soldiers of the 25th Infantry Division conduct Combat Rubber Raiding Craft Training in Hawaii. (Photo by SSG Armando Limon, DoD, 29 Nov 2017). SOF News Update 20171201 – Standards at SFQC slipping, Jaded Thunder exercise, former Navy SEAL running for Congress, abandoning the Kurds, STS in Faryab province, innish Winter War anniversary, U.S. advisors to accompany lower level Afghan units, UAE in Yemen, Niger approves armed drones, U.S. reps visit Tampa, Army cancels ICSR, Afghan SOF to double, AFCEA president comments on SOF, law aspects of hybrid war explained, female free diver trains up German SOF, and more. Standards at SFQC Slipping? An anonymous email sent by an NCO working at Fort Bragg, NC has caused a great deal of discontent in the Special Forces community. The email, posted on the website of SOFREP, alleges that training standards have dropped significantly with in the Special Forces training pipeline. MG Kurt Sonnetag, the commander of the Special Warfare Center and School (SWCS), issued a quick response denying the contents of the email. Read more in “Army probes criticism of Green Beret training”, AP News, November 30, 2017. Jaded Thunder Exercise. The Joint Special Operations Command (JSOC) brings in various aerial assets to teach its operators how to apply their deadly capabilities with finesse. Read “Jaded Thunder Exercise Trains Elite Troops to Call in Almost Any Sort of Fire Support”, The War Zone, November 30, 2017. Abandoning the Kurds? The Kurds of Iraq and Syria proved themselves to be very dependable allies in the fight against the Islamic State. Now that the territorial expanse of ISIS has diminished what now? Will the U.S. stop supporting the Kurds? Turkey would surely welcome that prospect. Read more in “Has Trump Ditched the Kurdish Fighters Who Defeated ISIS? Maybe Not”, The Daily Beast, November 28, 2017. U.S. House Reps visit Tampa. Members of the U.S. House of Representatives recently visited USSOCOM to learn about the command. (USSOCOM, Nov 2017). Female Free Diver Trains up German SOF. A free diver champion has spent a considerable amount of time training up German special operations forces. (Deeper Blue, Nov 29, 2017). Niger Approves Armed Drones. The government of Niger has given the go-ahead to the U.S. DoD to fly armed RPA within their borders. The drones will initially fly out of a Nigerien air base in Niamey and then, in time, from an air base in Agadez. The armed drones will likely provide a more responsive air support element to SOF teams operating in contested rural areas of Niger. (Reported by the NYTs). Navy Lawyer Explains ‘Hybrid Warfare’. As only a lawyer can, Douglass Cantrell explains the use of hybrid warfare within the context of the use of force under international law. Read “Hybrid Warfare: Aggression and Coercion in the Gray Zone”, American Society of International Law, November 29, 2017. Afghan SOF to Double. The Afghan government plans to double the size of it’s special operations forces. Afghanistan has SOF units within its Ministry of Defense as well as its Ministry of Interior. (Khaama Press, Dec 1, 2017). Finnish Winter War Anniversary. On November 30, 1939 the Soviet Union invaded the small nation of Finland. The supposed quick victory by the Russians turned out to be a long grind. Allegedly the Finns would joke about the huge Russian invading armies – “They are so many, and our country is so small, where shall we find the room to bury them all?”. UAE in Yemen. The United Arab Emirates have been playing a key role in stabilizing the Middle East. They are deeply involved in Somalia, Yemen, and other locations. In addition, they have been constant allies of the United States in Afghanistan – providing SOF units to work with U.S. SOF. An article by Bennett Seftel – deputy director of analysis at The Cipher Brief“UAE’s Share of the Task Fighting al Qaeda in Yemen” – provides an update about the UAE in Yemen. Read , The Cipher Brief, November 30, 2017. Army Cancels ICSR. The Army’s Interim Combat Service Rifle is dead. The short-lived program has had its funds transferred to the Next Generation Squad Weapon (NGSW). Read more in “Army Cancels Short-Term Rifle Replacement Program”, Army Times, November 30, 2017. President of AFCEA Comments on SOF. The president of the AFCEA, Lt. Gen. Robert M. Shea, USMC (Ret. ), provides insight on the nature of SOF in today’s troubled times. Read “President’s Commentary: SOF Carries a Big Stick”, Signal, December 1, 2017. STS in Faryab Province. Members of the AFSOC special tactics recently visited Faryab province, Afghanistan to discuss plans to increase airpower at airfields in the remote province. They conducted multiple airfield surveys along with Afghan counterparts. (USAF, Nov 30, 2017). Advisors at Lower Echelons in Afghan Fight. U.S. General John Nicholson says that more U.S. troops will be deployed to lower level Afghan units as advisors. That will likely increase casualties. (NPR, Nov 28, 2017). Nicholson Praises MoI’s NMUs. General John Nicholson, commander of Resolute Support in Afghanistan, offered praise for the Afghan police National Mission Units (NMUs) of the General Command Police Special Units (GCPSU). (Tolo News, Nov 30, 2017). Former Navy SEAL is running for Congress. Dan Crenshaw of Texas is running for Congress. He fought in Afghanistan, Iraq, and deployed around the world. Now he wants to fight in the halls of Congress.